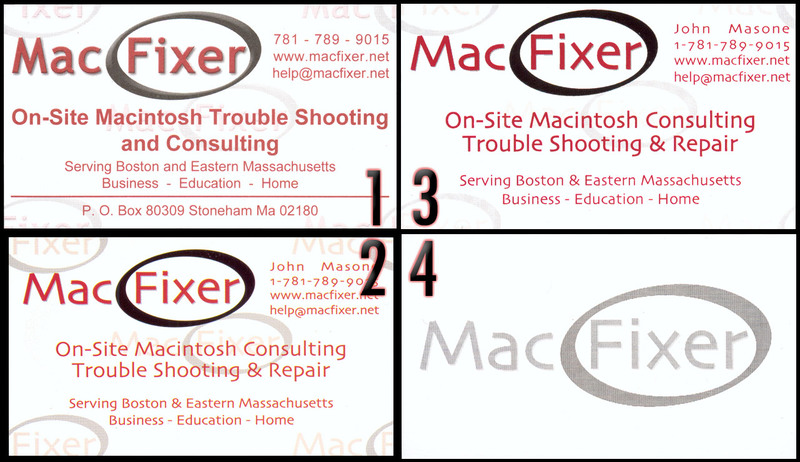 1) My original business cards from 2002. I made my logo in Photoshop! Using layer styles! How foolish. 2) My new card, printed with VistaPrint. Viewing the full 1200 DPI scan, I could see that the magenta and yellow of their CMYK printer wasn't aligned, which partly explains why the color is so far off. Also note how the card is too small. And (i've been over all this in my recent VistaPrint posting) the white background is much yellower in person than it scanned to. 3) My new card printed at Swifty Printing in Arlington. The resolution of their printer seemed a little low, but otherwise the card came out far superior to the VistaPrint card. The white is so bright white, and the red and black in just jump right out at you. 4) The back of the card. I thought it would be a nice touch. 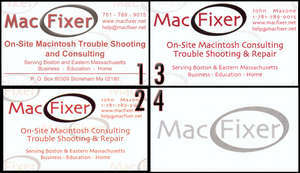 The new cards feature my new MacFixer logo. The new logo is all vector art in illustrator. The text is solid red. The loop is solid black. And the text shadow is solid grey. Also, by popular demand, my name is on my new card. And my mailing address is off, because no one will need that. That is, unless they are mailing me my money, but my mailing address is on my invoice.